Rachio Smart Sprinkler Controller WiFi Alexa Phone 8 Zone Watering Irrigation. Condition is New. Shipped with USPS Priority Mail. 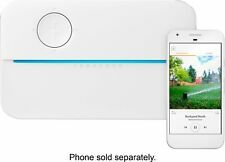 Smart Sprinkler Accessory. Burst Pressure Flow Range LoRa® wireless network. iOS 10.3 or Android 4.4 (subject to change). Winterize system without removing flow sensor. Two AA batteries. 32F to 120F; freeze-proof with no water in the system. Set your own schedules or input details like plant type and sun exposure to let Rachio automatically water your lawn with exactly what it needs to thrive, and not a drop more. Expert Service. Unbeatable Price. 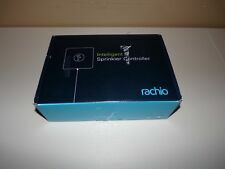 Rachio 16 Zone 1st Generation Smart Sprinkler Controller. Rachio is used and in perfect working condition. Rachio is the smart irrigation controller that makes it easy and affordable for homeowners to have beautiful, sustainable landscapes. It seamlessly integrates with your home's Wi-Fi, giving you complete control right from your smartphone or laptop. Rachio automatically adjusts your watering schedule based on weather, seasonality, zone-type and regional characteristics. Shipped with USPS Priority Mail. Better data, smarter watering - Rachio Water Reports confirm how much water you're using and saving. No need to schedule it. EPA Water Sense Certified Product - Check with your local water municipality for rebate options. It makes running your sprinklers easy and convenient while saving you water and money. Best-in-class testing and certification, Rachio has been awarded the EPA WaterSense certification and SWAT tested by independent third party labs. 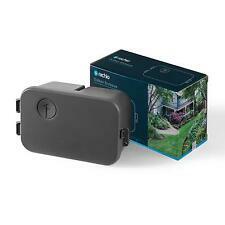 New in Box Rachio Outdoor Enclosure Only. Type: Sprinkler System. Size: 16 Zone. Power source: Electric. Better data, smarter watering - Rachio Water Reports confirm how much water you're using and saving. Rachio automatically adjusts your watering schedule based on weather, seasonality, zone-type and regional characteristics. The adapter has previously been replaced by Rachio. Product Details Product details have been supplied by the Manufacturer, and are hosted by a third party. More savings. Baby & Kids. Clothing & Luggage. Phone & Accessories. NE, NV, NH, NJ, NM, NY, NC, ND, MP, OH, OK, OR, PW, PA, PR, RI, SC, SD, TN, TX, UT, VT, VI, VA, WA, WV, WI, WY. Product Details Product details have been supplied by the Manufacturer, and are hosted by a third party. More savings. Baby & Kids. Phone & Accessories. NE, NV, NH, NJ, NM, NY, NC, ND, MP, OH, OK, OR, PW, PA, PR, RI, SC, SD, TN, TX, UT, VT, VI, VA, WA, WV, WI, WY.